py.test -v --junitxml=result.xml --cov-report html --cov-report xml --cov . provision cloud virtual machines (currently AWS EC2) if needed with fabric and boto, e.g. 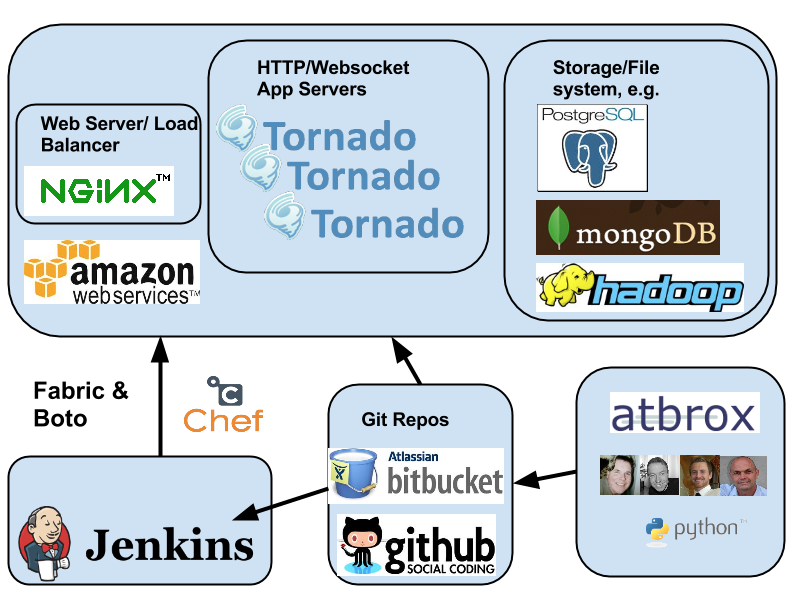 deploy to provisioned or existing machines with fabric and chef (solo), e.g. Fortunately Happy customer (and atbrox developer). Goto 1. # send click to form and receive result?? Side note: We’re proponents and bullish of Python and it is inspirational to observe the trend that several major Internet/Mobile startups/companies are using it for their backend development, e.g. Instagram, Path, Quora, Pinterest, Reddit, Disqus, Mozilla and Dropbox. The largest python-based backends probably serve more traffic than 99.9% of the world’s web and mobile sites, and that is usually sufficient capability for most projects. This entry was posted in cloud computing, continuous deployment, infrastructure, tracer bullet development and tagged automation, continuous deployment, software engineering. Bookmark the permalink.